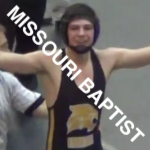 Clayton Wegener - MBU - Purler Wrestling Inc.
2013 Missouri 4A State Qualifier 120 Lbs. 2013 Blue Chip Nationals All-American 132 Lbs. 2014 Missouri 4A State Qualifier 138 Lbs. 2014 Missouri Freestyle State Championship All-American 152 Lbs.